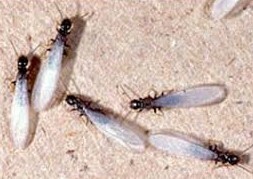 SWARMERS: Swarmers, or “alates” are young female and winged termites that often invade homes in the springtime. They especially seek out buildings that have sustained damage from severe winter weather. Once swarmers have determined your home to be a good ﬁt, it’s likely that the rest of the termite colony will follow. 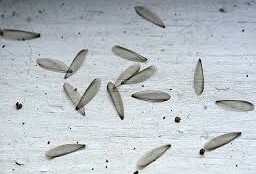 DISCARDED WINGS: The discarded wings of swarmers can often be found near windowsills and doors and are often the ﬁrst and only outwardly visible sign of a termite problem. WOOD DAMAGE: Termites tend to eat wood from the inside out, so wood that sounds hollow when tapped often signiﬁes a termite infestation. Homeowners should also look for rotting wood and cracked or bubbling paint, as these are signs of moisture buildup that could either mean water damage or termites. Mission Pest Management LLC offers a variety of termite treatment options to protect your most important investment-your home.